Following the disappointment of their 2-2 draw with Girona on Sunday, Barcelona are back in action on Wednesday when they take on Leganes in another La Liga test for the reigning champions. Ernesto Valverde’s side are now level on points at the top of the table with Real Madrid, who triumphed 1-0 over Espanyol on Saturday, and a win is essential to maintain their status as the early pacesetters this term. Leganes, meanwhile, come into this game in atrocious form, currently winless from five ​La Liga games, and face the unenviable task of keeping an in-form Lionel Messi and his partners in crime quiet at Estadio Municipal de Butarque. Here’s everything you need to know ahead of the clash. In September 2016, La Blaugrana fired five past a helpless Leganes as Messi took centre stage with a brace. His first, an easy tap in from Luis Suarez’s low cross, punished the hosts for committing too many players forward, before the Argentine returned the favour to his Uruguayan teammate with an identical goal following some sloppy Leganes passing. ​Neymar soon got in on the act, capitalising on another pass across goal before Messi scored again, this time a cool penalty swiped into the top corner to seal the result ten minutes into the second half. Rafinha then netted an outrageous long range screamer before the scoring was completed as Leganes' Gabriel curled a free kick into the top corner. It was peak MSN interplay that proved all too much for the hosts, with Messi, Suarez and Neymar assisting each other brilliantly. 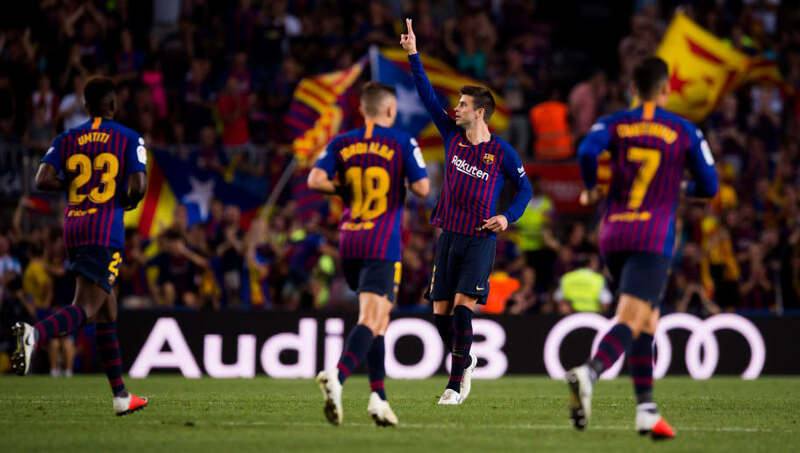 ​Barcelona probably would have beaten Girona had Clement Lenglet not been sent off, and even though they couldn’t get the job done, Messi still looked a serious threat as he tried in vain to carry the Catalan giants to victory. The 31-year-old possesses such strength in ghosting past opposition players in midfield areas and this is where Leganes will need to be at their most stubborn, in particular Ruben Perez. The Spaniard, known for his tackling and interception ability, will need to help clog up the central areas to stop Messi having that big of an impact. It’s pretty much an impossible task, because if Messi doesn’t get you then Philippe Coutinho or Luis Suarez probably will, but it’s still essential that Leganes give the forward as little space as possible. For the hosts, Alexander Szymanowski is out, while Ezequiel Munoz is a doubt. Recio is carrying a knock but is expected to start, while Mauricio Pellegrino could bring in Raul Garcia in place of Jonathan Silva at left back. Clement Lenglet is suspended for the visitors following his straight red card at the weekend, so Barca’s usual centre back pairing of Gerard Pique and Samuel Umtiti should feature. Ivan Rakitic is expected to start ahead of Arthur and ​Arturo Vidal, with Rafinha making up the midfield three alongside Sergio Busquets. Coutinho could start on the left wing instead of ​Ousmane Dembele, with the Frenchman set to be rested. Predicted Leganes Lineup: Cuellar; Garcia, Slovas, Bustinza, Nyom; Gumbau, Perez, Recio; Rolan, Carrilo, Zoar. Predicted Barcelona Lineup: ​Ter Stegen; ​Roberto, ​Pique, Umtiti, Alba; ​Rafinha, Busquets, ​Rakitic; ​Messi, ​Suarez, Coutinho. Expect Barca to be on the ball right from the off, with the disappointment of their recent draw against Girona fresh in their minds. Leganes can take confidence from the defensive deficiencies Barcelona showed at the weekend, but whether they’ll be able to use their opponent’s weakness to their own advantage remains to be seen. Don’t be surprised if Valverde’s side leak a goal, but they should have far too much for a side currently languishing at the bottom of La Liga.